Baking is a science and unless you know the science behind the reactors reacting with the reactive agents, you will not be able to bake perfectly. For beginners, among all, two things should be kept in mind. One: while making yeast bread, don't ever dilute yeast in hot or boiling water. It will kill the yeast and your bread will not rise. Two: Baking yeast bread involves a lot of patience. It is time-consuming. Unless you are ready to devote at least 3-4 hours to follow through on the requisite steps involved, don't attempt it. Believe me, it's not everyone's cup of tea. 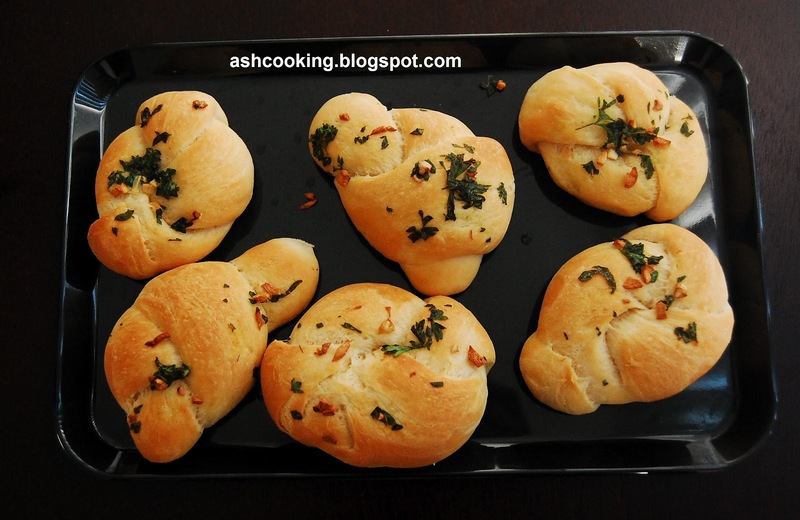 The Garlic Knots detailed below is one of my favourite items for dinner. It serves as a great accompaniment to a bowl of soup. 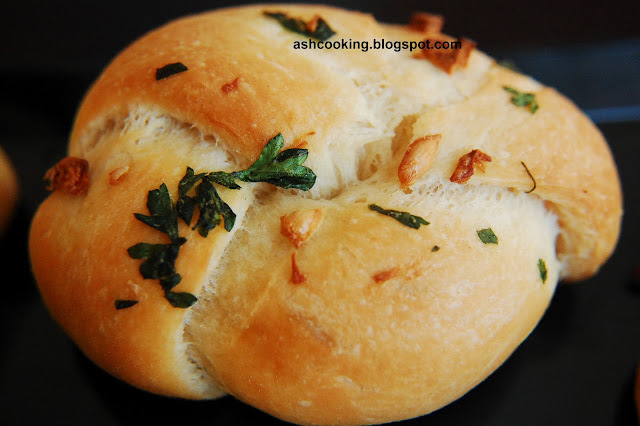 A beautiful aroma of garlic and fresh parsley leaves permeates the air as the baking comes to a close. 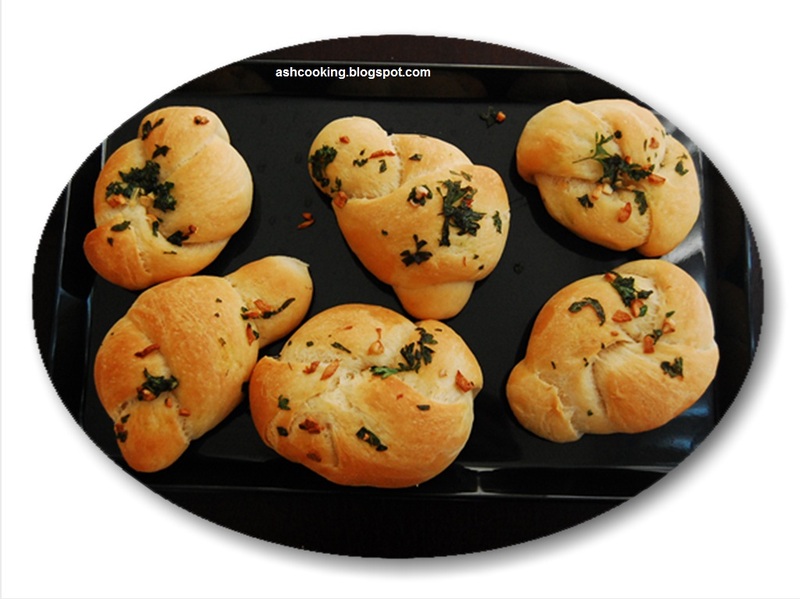 Best served as warm, garlic knots taste great even in room temperature. 1) Take the bowl of lukewarm water and sprinkle the yeast on the surface. Wait for 5 minutes before you stir it into the water. Give it a standing time of 10 minutes until it becomes a bit frothy. 2) Now toss together the dry ingredients - bread flour, salt and sugar in a mixing bowl. Make a well in between using your fingers. Pour in olive oil and the yeast infused water. Gently stir with a spatula if you are doing it by hand. If using machine, run it at slow speed. 3) Add the milk and knead soft dough. 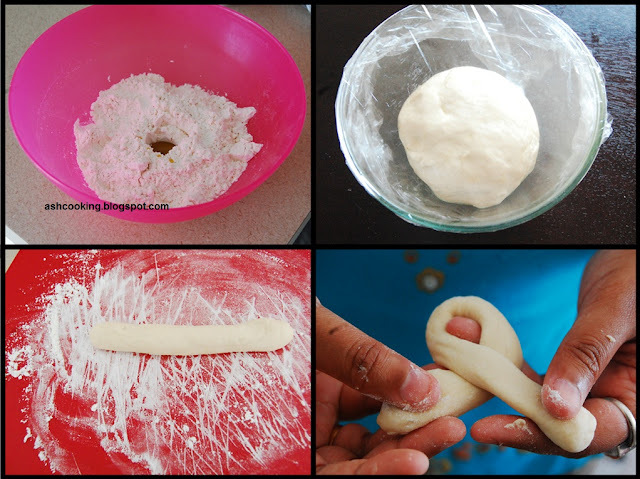 It will be little tacky in the beginning, hence dust your hands with flour to avoid the dough sticking to your fingers. Keep kneading for 10-15 minutes until the dough becomes supple and elastic. 5) When the dough becomes double in size, deflate it by punching your fist in it. It will release the carbon-di-oxide that the yeast reacting with sugar has created. It will thus become pliable enough to be molded into any shape. 6) Now divide the dough into 10 balls. Beginning with one at a time on a floured surface, roll them, slightly pressing them with your palm, into 8-9 inch long rope. 7) Tie a knot. Keep the tails loose if you like. Or tuck the tails into the centre from over and under the knot. 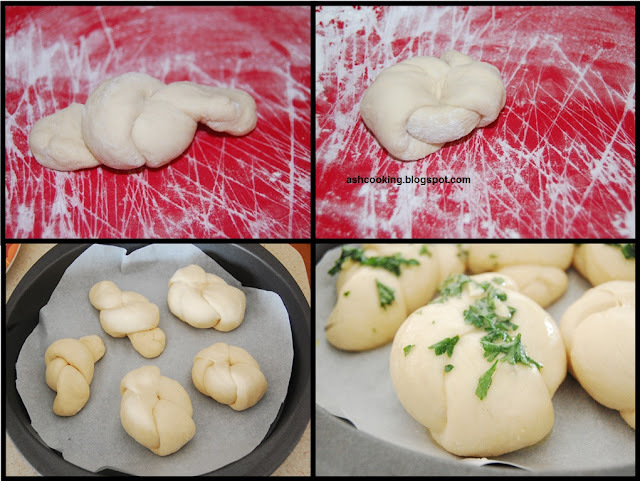 8) Transfer the knots into baking sheets lined with parchment paper. Brush the tops with a bit of olive oil. Then cover them with warm kitchen towels. Allow them at least 45 minutes to an hour time to rise for the second time. 9) Meanwhile, prepare the glaze by melting butter and mixing the minced garlic in it. Add parsley leaves and stir in well. As and when the knots will double in size, brush the glaze on tops. 10) Preheat oven to 375° F/ 190° C. Bake for 15-20 minutes till the tops are slightly browned. 11) Serve warm. The exterior will be flavorfully crisp with the interior soft. Garlic knots, the very name itself brings water in my mouth.